Heat tortillas over an open flame to soften them. In a large bowl, mix mashed potatoes, onion, and tomatoes. Fill the center of each tortilla with 2 heaping tablespoons of mashed potato mixture. Fold the tortilla and close with a toothpick on each side to keep it secured. In a large frying pan over medium heat, add in vegetable oil and allow to get hot. Add in a few tacos at a time. Fry on each side for 7 to 10 minutes or until crispy. Repeat until all tacos are fried. Remove taco from oil and allow to drain on a paper towel lined plate. Garnish with red or green salsa. Serve and enjoy! You can also garnish with cheddar cheese and sour cream. Saying that my fiancé and my son are potato lovers is a massive understatement. Those two could eat potatoes all day long! So it would seem right to think they would love anything I make with potatoes, right? Not at all! Besides being spud-super-fans, they are also potato snobs! I feel the pressure; basically, I’ve created potato monsters! It’s funny because out of all the potato recipes I cook for them, one of their favorite is the very basic but appetizing: potato tacos. They go absolutely freaking bananas for them! The great thing is that I don’t even have to work all that hard at it, and every time I make them, I end up as their hero! 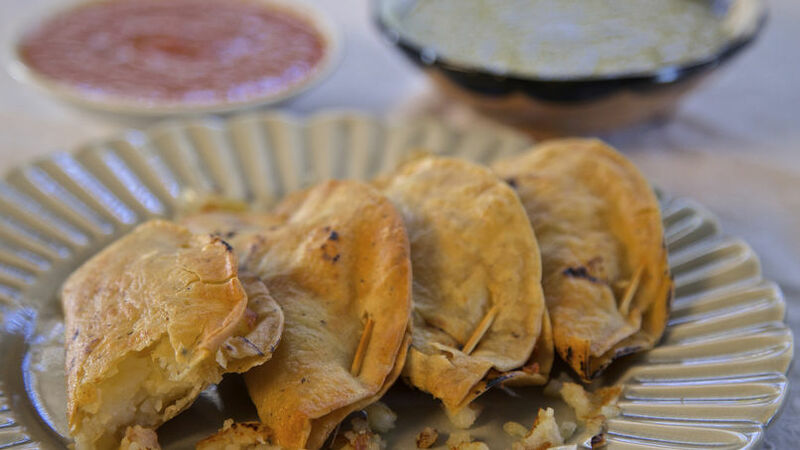 The potato taco is the most popular of vegetarian tacos. To me, they only go well with hard-shell tacos. Since I use a mashed–like potato, the main ingredient is already soft so it doesn’t really go well with a soft tortilla. Also, almost any salsa, red or green, will go well with these tacos! Give them a go and become your family’s own hero!